© Stacey et al. ; Licensee Bentham Open. Context: Fibromyalgia is a chronic musculoskeletal pain disorder. The pain can be intractable and may not respond to commonly-used treatments, such as tricyclic antidepressants and opioids. Objectives: To evaluate pregabalin response in the subset of patients with fibromyalgia whose pain had been judged refractory to other treatments. Methods: Patients had previously participated in a controlled trial of pregabalin and had moderate to severe pain despite treatment with gabapentin, a tricyclic antidepressant, and a third medication (e.g., other anticonvulsants, opioid, selective serotonin reuptake inhibitors, tramadol). Flexible-dose pregabalin 150-600 mg/day was added for 3-month treatment cycles, each followed by 3- to 28-day pregabalin “drug holiday” that lasted until a relapse occurred. Pain intensity was measured using the visual analogue scale of the Short-Form McGill Pain Questionnaire completed at baseline, the end of each 3-month treatment period and at the relapse visit. Analysis was at 15 months (after 5 cycles). Results: In total, 25 patients were included and 19 completed the 15-month analysis period. At baseline, 88% were receiving ≥1 pain medication. Pregabalin 150-600 mg/day was associated with statistically significant, clinically meaningful pain reduction during each treatment cycle. Pain quickly returned to baseline levels during the “drug holidays” in a median time of 2-4 days. Somnolence (n=5) and dizziness (n=4) were the most common adverse events. Conclusions: These results suggest that pregabalin may be beneficial in patients with fibromyalgia who have had an unsatisfactory response to treatment with other medications. Keywords: Pregabalin, anticonvulsant, fibromyalgia, pain, refractory, relapse, chronic widespread pain, open-label..
Fibromyalgia (FM) is a chronic pain disorder characterized by widespread pain and tenderness in all four quadrants of the body . The condition affects significantly more women than men, with worldwide prevalence estimates ranging from 0.5% to 5.0% . The chronic widespread pain associated with fibromyalgia is often accompanied by other painful symptoms including joint pain, headache and low back pain , and additional disabling symptoms such as sleep disturbance and fatigue . Fibromyalgia can be profoundly disabling and many studies have shown that people with FM have poor quality of life and substantial functional impairment [4, 5]. The economic burden of FM is substantial . The etiology and pathogenesis of FM are not well understood, but it has been postulated that the condition is a rheumatologic disorder in which the associated pain is driven primarily by central sensitization that may involve several neuronal systems . Pharmacological treatment options for which there is supportive evidence include antidepressants, anticonvulsants and tramadol . Three agents, pregabalin, duloxetine, and milnacipran, are now approved by the Food and Drug Administration (FDA) in the United States for the management of FM . Pregabalin is an α2-δ ligand with analgesic activity that is mediated by its ability to bind with high affinity to the α2-δ subunit of voltage-gated calcium channels in central nervous system (CNS) tissues . Pregabalin 300-600 mg/day has been shown in controlled trials to be effective in the treatment of fibromyalgia [11-14] and in the treatment of neuropathic pain . In this paper, we report the results from an analysis of patients with FM who were refractory to other treatments who had entered a long-term, open-label study of pregabalin after participating in a randomized controlled trial. Patients with FM according to American College of Rheumatology criteria  had taken part in an optional open-label extension trial that followed an 8-week multi-site controlled trial of pregabalin 150-600 mg/day . After the extension study was closed, patients reverted to usual care. Patients must have received treatment with standard treatments (as defined below) for a total of at least 6 months before they were eligible to be enrolled into this study. All participants provided written, informed consent. The study was approved by Institutional Review Boards. To be eligible patients had to be refractory to treatment with gabapentin ≥1800 mg/day, a tricyclic antidepressant (TCA) ≥75 mg/day, and a third line medication, which included other anticonvulsants, opioid analgesics, compound analgesics, selective serotonin reuptake inhibitors (SSRIs), serotonin norepinephrine reuptake inhibitors (SNRIs), non-steroidal anti-inflammatory drugs (NSAIDs), cyclooxy-genase II inhibitors (Cox IIs) and tramadol. Refractoriness was defined as inadequate pain relief despite treatment for at least 2 weeks at or above the minimum dose and/or intolerable side-effects with each of the three medications or medication groups listed above. Patients were required to have a score of at least 40 mm on the 0-100 mm visual analogue scale (VAS) of pain intensity of the Short-Form McGill Pain Questionnaire (SF-MPQ; “no pain” to “worst possible pain”) . Patients were allowed to remain on analgesic medications, including drugs to which they were refractory, and these could be adjusted during the study. The details of the overall study and results for the patients with postherpetic neuralgia and diabetic peripheral neuropathy who entered this follow-on study have been reported elsewhere . Patients received flexible-dose pregabalin 150-600 mg/day, taken three times a day (TID), for 3 months, followed by a 3 to 28-day period during which pregabalin was discontinued (“drug holiday”). The starting dosage of 150 mg/day could be increased after 1 week, after which pregabalin dosing was flexible at the discretion of the investigator. Patients who experienced a relapse during each drug holiday were allowed to resume a further 3 months of treatment. Relapse was defined as scoring “moderately worse”, “much worse” or “very much worse” in answer to the question “how much has your pain worsened since discontinuing study medication?” Patients who did not relapse were discontinued. After four consecutive drug holidays, patients could continue pregabalin without further drug withdrawals. At the end of each 3-month pregabalin treatment period patients were required have a clinical visit during which the SF-MPQ VAS was completed and adverse events were recorded. Patients who relapsed during the drug holiday were required to complete a pain VAS and have the relapse confirmed by the investigator. If a patient did not meet relapse criteria they could be assessed once more within the 28-day drug holiday. Mean pain VAS scores were calculated at baseline, the end of each 3-month treatment period, and during the drug holidays. 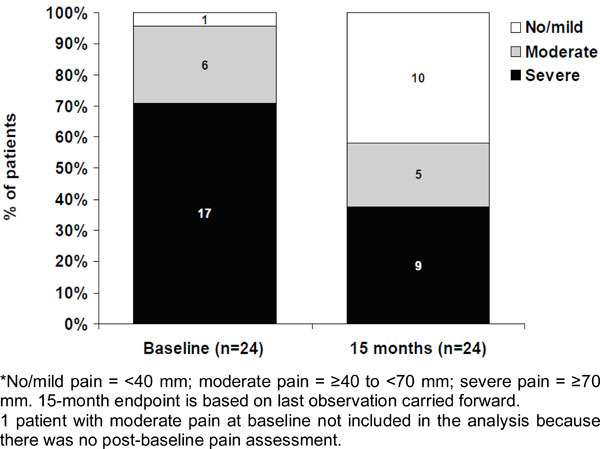 The distribution of patients with no/mild, moderate, and severe pain (no/mild pain = <40 mm; moderate pain = ≥40 to <70 mm; severe pain = ≥70 mm) at the 15 month endpoint was determined based on the last pain VAS score on pregabalin treatment carried forward. The numbers of patients with ≥30% and ≥50% reductions in the pain score from baseline to the end of the first 3-month treatment period and to the fifth 3-month treatment period endpoint were also determined in the same manner. The protocol for this study did not specify inferential testing of treatment effectiveness, but because of the unique nature of the study design and data, we performed analyses of the statistical significance of the mean changes from baseline in pain intensity as measured by the SF-MPQ VAS. The data examined in this report were limited to the first 15 months of pregabalin treatment of this trial because after that point the drug holidays were discontinued and the study became a standard open-label trial. In total, 25 patients with FM (76% female; mean age 54 years) were enrolled into the study and are included in this analysis. The baseline characteristics for these patients are shown in Table 1. Most patients (88%) were taking other pain medications, despite being refractory to them, and almost 70% had severe pain at baseline. Of the 25 FM patients enrolled, 19 (76%) completed 15 months of pregabalin treatment. Reasons for discontinuation were as follows: two patients due to adverse events, one due to lack of efficacy, and three were non-compliant or discontinued for other reasons. Four out of the six patients who discontinued did so during the first 3-month treatment period. All patients relapsed during the four drug holidays. The median duration of each of the drug holidays was 3-4 days (Table 1). The mean (standard deviation, SD) daily pregabalin dose was 385 (148) mg during the first 3 months, 424 (168) mg from months 3-6 and 463 (151) mg from months 12-15. * Severe pain includes patients with SF-MPQ pain VAS ≥70mm. † Includes medications to which patients were refractory. One patient did not have a post-baseline pain assessment so was not included in the analysis of pain. The mean SF-MPQ VAS scores for each 3-month treatment period were similar, and were statistically significantly and substantially lower than the baseline score (Fig. 1). Mean pain scores on pregabalin treatment improved by 30% from baseline at endpoint. The reduction in pain scores observed in each treatment period ranged from 30 to 45%. During each of the drug holidays, mean pain VAS scores increased substantially, returning to at least baseline levels (Fig. 1). There was a notable change in the pain severity distribution between baseline and the 15-month endpoint (Fig. 2). At 3 months of pregabalin treatment, 54% and 50% of patients had a ≥30 and ≥50% reduction in pain from baseline, respectively. At endpoint of pregabalin treatment, 46% and 38% of patients had a ≥30 and ≥50% reduction in pain from baseline, respectively. Somnolence (5/25; 20%) and dizziness (4/25; 16%) were the most frequently reported treatment-emergent adverse events. Mean pain VAS scores during 3-month pregabalin treatment periods and during pregabalin drug holidays. Pain severity* distribution at baseline and the 15-month endpoint. This investigation of patients with longstanding, chronic FM who were refractory to the conventional treatments being used at the time of the study demonstrated a clinically meaningful pain reduction  with pregabalin treatment that was maintained for over a year. As was evident from the baseline pain scores patients continued to experience notable levels of pain despite being on treatment with TCAs, gabapentin and 3rd line agents. Many such patients experience ongoing – often severe – pain and continue to take medications despite their limited effectiveness. Pregabalin was associated with improvement in pain at the end of the first 3-month treatment period. Pain rapidly returned to pre-treatment levels soon after pregabalin was stopped for four mandatory drug holidays. This pattern of significant and substantial relief on pregabalin, followed by pain returning to baseline levels upon pregabalin discontinuation, was remarkably consistent throughout the five 3-month pregabalin treatment periods and four pregabalin drug holidays. Evidence of the clinical relevance of the improvement in pain with pregabalin treatment is provided by the fact that 68% of patients had severe pain at baseline and only 38% did so after 15 months of pregabalin treatment. Importantly, 42% of patients had no/mild pain at 15 months. Around half the patients had a ≥30% reduction in pain after 3 and 15 months of treatment, further demonstrating that clinically meaningful pain relief was achieved and sustained with long-term pregabalin treatment. The mean changes in pain scores (~30%-45% across treatment periods) can also be considered clinical relevant , but concluding that the marked improvements in pain were entirely due to pregabalin is not possible because there was no control for placebo responses and other non-specific effects. While the mean daily dose of pregabalin increased over the 15 months of this study, the effect of pregabalin was maintained at a mean dose (463 mg/day) just slightly above the subsequently FDA-approved therapeutic dosage range of 150-450 mg/day. Pregabalin was generally well tolerated. The discontinuation rate due to adverse events was low (8%) and the most common adverse events, somnolence and dizziness, were consistent with previously reported controlled trials in fibromyalgia [11-14]. Although the etiology and pathology of fibromyalgia remains to be established, recent evidence suggests that dysfunction within the CNS, including central sensitization, may be responsible for the chronic, widespread pain that is the hallmark of fibromyalgia [19, 20]. The precise mechanism of action of pregabalin that underpins the improvement in pain has not been fully elucidated. However, by binding to the α2-δ subunit of voltage-gated calcium channels in the CNS and modulating calcium channel function pregabalin has been shown to reduce neurotransmitter release from pre-synaptic, hyperexcited nerve terminals . It has been proposed that via such actions pregabalin may modulate central sensitization, with a resultant analgesic effect . This unique study enrolled treatment resistant patients that went through a mandatory drug withdrawal and subsequent relapse. This study demonstrated sustained pregabalin effect. The study has limitations due to its open-label design involving a relatively small number of patients who had previously participated in a controlled clinical trial (and hence may be subject to selection bias). The results complement the findings of previously completed placebo-controlled, double-blind studies in FM and suggest that pregabalin may provide clinically meaningful and sustained pain relief for patients with FM who are refractory to other commonly-used treatments. The most recent evidence-based guidelines specifically related to the management of FM have been developed by EULAR, and pregabalin is now a recommended treatment option . Although evidence from the randomized, controlled clinical trials suggest that pregabalin is an effective first- or second-line option in FM it is reassuring that, based on the results of this study, the treatment also appears to offer a treatment option to patients who have failed to respond to previous treatment with commonly used agents, and also the potential to avoid stepping up to an opioid regimen. This study was funded by Pfizer Inc. Editorial assistance was provided by Janet Bray MPharmS and funded by Pfizer Inc.
Not applicable – this open label extension study was commenced before the trial registration system was established. Dr. Stacey has received grants from Astra Zeneca, and has acted as a paid consultant to Glaxo Smith Kline, Pfizer, Lilly, Nektar, QRX Pharma, Boston Scientific, Astra-Zeneca, Xenon, Boehringer Ingelheim. He was not compensated for his work on this manuscript. Drs Emir, Petersel and Murphy are employees of Pfizer Inc.
 Wolfe F, Smythe HA, Yunus MB, et al. The American College of Rheumatology 1990 Criteria for the Classification of Fibromyalgia Report of the Multicenter Criteria Committee Arthritis Rheum 1990; 33: 160-72. White KP, Harth M. Classification, epidemiology, and natural history of fibromyalgia Curr Pain Headache Rep 2001; 5: 320-9. Choy E, Perrot S, Leon T, et al. A patient survey of the impact of fibromyalgia and the journey to diagnosis BMC Health Serv Res 2010; 10: 102-0. Hoffman DL, Dukes EM. The health status burden of people with fibromyalgia: a review of studies that assessed health status with the SF-36 or the SF-12 Int J Clin Pract 2008; 62: 115-26. Salaffi F, Sarzi-Puttini P, Girolimetti R, et al. Health-related quality of life in fibromyalgia patients: a comparison with rheumatoid arthritis patients and the general population using the SF-36 health survey Clin Exp Rheumatol 2009; 27: S67-74. Lachaine J, Beauchemin C, Landry PA. Clinical and economic characteristics of patients with fibromyalgia syndrome Clin J Pain 2010; 26: 284-90. Perrot S, Dickenson AH, Bennett RM. Fibromyalgia: harmonizing science with clinical practice considerations Pain Pract 2008; 8: 177-89. Goldenberg DL, Burckhardt C, Crofford L. Management of fibromyalgia syndrome JAMA 2004; 292: 2388-95. Briley M. Drugs to treat fibromyalgia - the transatlantic difference Curr Opin Investig Drugs 2010; 11: 16-8. Field MJ, Cox PJ, Stott E, et al. Identification of the α2-γ-1 subunit of voltage-dependent calcium channels as a molecular target for pain mediating the analgesic actions of pregabalin Proc Natl Acad Sci USA 2006; 103: 17537-42. Crofford LJ, Rowbotham MC, Mease PJ, et al. Pregabalin for the treatment of fibromyalgia syndrome: results of a randomized, double-blind, placebo-controlled trial Arthritis Rheum 2005; 52: 1264-73. Arnold LM, Russell IJ, Diri EW, et al. A 14-week, randomized, double-blinded, placebo-controlled monotherapy trial of pregabalin in patients with fibromyalgia J Pain 2008; 9: 792-05. Mease PJ, Russell IJ, Arnold LM, et al. A randomized, double-blind, placebo-controlled, phase III trial of pregabalin in the treatment of patients with fibromyalgia J Rheumatol 2008; 35: 502-14. Crofford LJ, Mease PJ, Simpson SL, et al. Fibromyalgia relapse evaluation and efficacy for durability of meaningful relief (FREEDOM): a 6-month, double-blind, placebo-controlled trial with pregabalin Pain 2008; 136: 419-31. Stacey BR, Swift JN. Pregabalin for neuropathic pain based on recent clinical trials Curr Pain Headache Rep 2006; 10: 179-84. Melzack R. The short-form McGill pain questionnaire Pain 1987; 30: 191-97. Stacey BR, Dworkin RH, Murphy K, Sharma U, Emir B, Griesing T. Pregabalin in the treatment of refractory neuropathic pain: results of a 15-month open-label trial Pain Med 2008; 9: 1202-8. Farrar JT, Young JP Jr, LaMoreaux L, Werth JL, Poole RM. Clinical importance of changes in chronic pain intensity measured on an 11-point numerical pain rating scale Pain 2001; 94: 149-58. Gracely RH, Petzke F, Wolf JM, Clauw DJ. Functional magnetic resonance imaging evidence of augmented pain processing in fibromyalgia Arthritis Rheum 2002; 46: 1333-43. Henriksson KG. Fibromyalgia--from syndrome to disease. Overview of pathogenetic mechanisms J Rehabil Med 2003; 41(Suppl): 89-94. Tuchman M, Barrett JA, Donevan S, Hedberg TG, Taylor CP. Central sensitization and Ca(V)alpha(2)delta ligands in chronic pain syndromes: pathologic processes and pharmacologic effect J Pain May 14 2010. Carville SF, Arendt-Nielsen S, Bliddal H, et al. EULAR evidence-based recommendations for the management of fibromyalgia syndrome Ann Rheum Dis 2008; 67: 536-41.